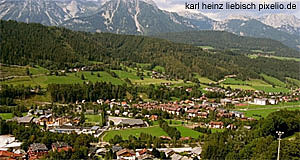 The small town of Schladming in the Styrian part of the Salzkammergut lies near the border to Salzburg. Most of the town′s many tourists are attracted by the superb skiing facilities that the surrounding mountains have to offer. After all, the glacier of nearby Mount Dachstein allow the skiing industry to keep their doors open all year round. However, the summer months are a lot more popular for hiking holidays. The history of Schladming can be tracked back in written documents to 1180, when there was a small settlement. By 1322, this settlement had grown into something that was worth receiving the statutes of a city - a rather significant move. This was due to the mining that was a big deal in Schladming and surroundings. At around 1350, there were as many as 1,500 miners employed in the blooming city. For those who are interested in the history of unions, Schladming might play a special role: It was here that miners signed a declaration, in which they demanded equal working conditions for all miners in Europe - in 1408! This declaration, called "Schladminger Bergbrief", reflects the miserable conditions in which miners had to work back then. And it preceded the reformation, which was largely nourished by social injustice rather than theological arguments. When the miners and farmers of Salzburg revolted against the Prince Archbishop in 1525, the miners of Schladming supported them. To re-establish peace and to underline his own power, Archduke Ferdinand I of Austria flattened the city and declared its city statutes invalid. Mining continued nonetheless - mostly for silver, lead, copper and cobalt ore. Only over the course of the 19th century, the mining activities ceased. The economic confidence of the region suffered badly from that and did not recover until the construction of a railway line in 1875. After this important event, tourism picked up and soon the first skiers contributed to Schladmings rise to one of Austria′s most popular skiing holiday destinations. As early as in 1908, a skiing association was founded. In 1925, the whole "don′t mess with the Archduke" was long forgotten and Schladming was made a city again. For a skiing resort, Schladming has surprisingly many sights to offer - on contrast to many other skiing resorts, which used to be villages until a century ago, Schladming has a more significant history and thus a few attractions. There is the town museum, housed in a former hospital, which is dedicated to the mining past of Schladming and surroundings. The town hall or Rathaus was built in 1884 by the Prince August of Saxony-Coburg and Gotha - originally as a hunting chateaux. There are some remains of the old city walls from 1629. And two churches - a Catholic one in late Romanesque style that was extended until 1532; and a Protestant one that was built between 1859 and 1862. There are several skiing areas that Schladming grants easy access to: The Planai is the most important one; the ski amade is further, but particularly scenic; and the Ramsau has a large variety of family-friendly slopes to offer. Attractions nearby include Radstadt in Salzburg; the Dachstein with its caves and scenic spots; Hallstatt, Gosau, Bad Aussee - and other pretty places in the Salzkammergut.